At Pure Movement Pilates, our group Pilates classes are always dynamic and creative, but with safety at the forefront. Class levels are established for each class to help students decide which class is best for their fitness level and goals. With classes limited to six participants, we pride ourselves in always designing classes for each individual in group. Beginner level classes. Appropriate for those who are not experienced movers, new to apparatus Pilates or have limitations due to joint pain, surgeries, or recovery. "Slow Joe" Pilates is a balanced mixed apparatus class, utilizing beginner stabilization movements for a slower moving class. This class is good for newbies, along with experienced students looking to relearn fundamental, but still challenging, movements. This class is considered a Level 1 class. Please discuss with your instructor or a studio representative if you have any questions or concerns if this class is right for you. Welcome to Pilates at Pure Movement! 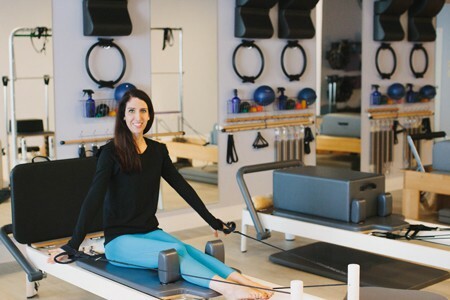 In this free introductory class, we’ll introduce basic Pilates principles like breathing, spinal position, form, and general how-to when it comes to working on the reformer to get you ready for future group apparatus classes or private sessions. This class is open to beginners who are new to our studio or new to the Pilates method. We HIGHLY recommend completing an introductory private prior to taking this class. This class is considered a Level 1 class. Please discuss with your instructor or studio representative if you have any questions or concerns if this class is right for you. Intermediate level classes. Appropriate for those who have Pilates apparatus or previous fitness experience. Modifications will be offered for those who have limitations due to joint pain, surgery, or recovery, but exercises will be tailored towards those at an intermediate level. The reformer at its finest: a class focusing on half strengthening exercises and half stretching movements. This class offers an overall feel good session and full-body workout for those looking to enhance their muscles and stamina while simultaneously increasing muscular range of movement. This class is considered a Level 2 class. Please discuss with your instructor or a studio representative if you have any questions or concerns if this class is right for you. Intermediate advanced level classes. Appropriate for those who have Pilates apparatus or previous fitness experience and have limited injuries or limitations. General knowledge of proper form, pacing, breathing, and exercises are expected at this level. Modifications can be offered for injuries or limitations, but exercises will be tailored towards those at a stronger, level of fitness. The reformer at its finest -- a class focusing on half strengthening exercises and half stretching movements. This class offers an overall feel good session and full-body workout for those looking to enhance their muscles and stamina while simultaneously increasing muscular range of movement. This class is considered a Level 2.5 class. Please discuss with your instructor or a studio representative if you have any questions or concerns if this class is right for you. 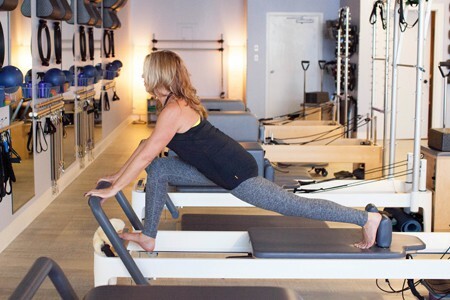 Our signature Core + Restore class is a unique combination of abdominal strength work with restorative Pilates reformer exercises. This class is good for all body types, but especially athletes looking for Pilates as a cross training method that combines dynamic core strengthening with release work. This class is considered a Level 2/2.5 class (see guide below). Please discuss with your instructor or a studio representative if you have any questions or concerns if this class is right for you. Dancers love Pilates for the strength and length it delivers – and in this class, we offer the best of both worlds. 30 minutes of traditional ballet “barre” work derived from Lottie Burk’s original ballet workouts combined with 30 minutes of Pilates reformer sequences, all completed to high paced, energetic music, for a fun, sweaty, and upbeat workout. Did you know that the Pilates repertoire includes multiple pieces of equipment? In our Mixed Apparatus class, we work on the reformer, half-trap, chair, orbit, Bodhi suspension ropes, and more all within an 55 minute class. This class takes student requests for which piece of equipment they would like to focus on in the day's session. Advanced level classes. Appropriate for those who have significant Pilates apparatus or previous fitness experience. Challenging movements and exercises will be included in this level of class. Modifications can be offered for injuries or limitations, but exercises will be tailored towards those at a strong, advanced level of fitness. Looking to further your Pilates physical and mental development? Advanced Focus Reformer is for those seeking a deeper understanding of the Pilates method through their own bodies and advanced movement. Each week focuses on a specific exercise theme with unique variations that allow you to still get an intense workout while building upon individual personal Pilates growth through advanced level work. This class is considered a Level 3 class. Please discuss with your instructor or a studio representative if you have any questions or concerns if this class is right for you. Cardio, anyone? Jumpboard is both a fun and challenging way to dynamically incorporate cardio work within a traditional Pilates reformer workout. Avoiding the physiological stresses of gravity impacts associated with regular jumping based activity, Reformer Jumpboard allows students, either laying down, sitting up, or kneeling horizontally on the reformer shuttle, to “jump” and bounce off of a platform attached to the reformer end. Great for endurance junkies, and those who want a safer and more fun way to receive aerobic exercise. Expect an intense, invigorating, and challenging 55 minute workout experience with plenty of fun. Tiny, but mighty! Originally designed as a workout piece for small NYC apartments, the combo chair offers a full body workout like you've never had before. Combining trapeze and gymnastic like movements, the combo chair works every muscle in your body to lift, strengthen, and tone your way to becoming the next Kerri Strug. The Bodhi Suspension System utilizes four adjustable ropes with multiple attachments for a unique combinations of strengthen training, Pilates, and stretching, all using your own body weight with suspension. Our Combo Chair + Bodhi Suspension Class is a workout like you've never had before. Come prepared to sweat, work, and tone. Our specialty series run in 4 to 8 week sessions and focus on a specific population or topic. Each series has a specific price and length, depending on the series, and when it is offered. Our men’s program is built to help men strengthen neglected muscle groups, improve flexibility, and build core strength. We focus on relieving back and joint pain on the Pilates reformer, while still working towards increasing strength in both smaller and large muscle groups. We have an emphasis on release work, in addition to working on movements to improve rotational sports, such as tennis and golf. Improve your posture, movement, and more in this popular series. Decades have shown how beneficial reformer Pilates is for dancers for injury prevention, core strength, flexibility and overall strength. We're so excited to offer this course to the dance community of Fort Wayne! Taught by Brittney Coughlin, associate professor of dance at IPFW. Classes will be geared towards building strength dancers need in addition to improving flexibility, abdominal control, and balance. Curious about the Pilates method and the apparatus behind it? This introductory 4 week series is for you! We’ll introduce basic Pilates principles like breathing, spinal position, form, and general how-to when it comes to working on the reformer to get you ready for group apparatus classes or private sessions. This series is strongly recommended for those who want to learn more about Pilates, learn the Pilates fundamentals, or are looking to improve their form in their current sessions. We find that students who begin with the Pilates basics get the most out of group classes.